I find it interesting that there are a number of Passover cookbooks but very few Easter cookbooks. Since we have been wishing everyone we know a Happy Easter, we thought we might take this opportunity to offer up a Passover entry. Since we realized we didn't have anything that might fill our Easter Cookbook needs, we thought we might give Passover the spotlight. 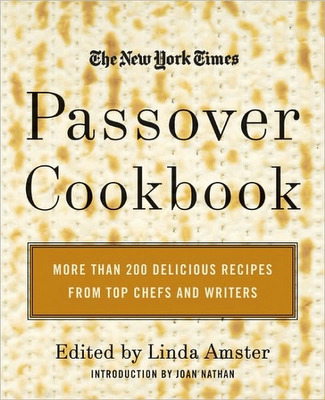 Linda Amster culled the New York Times archives to find this collection of great Passover recipes. No I will admit that I have never cooked for a Seder, but I have been to a couple. With this cookbook, it think I might just be able to cook for one. 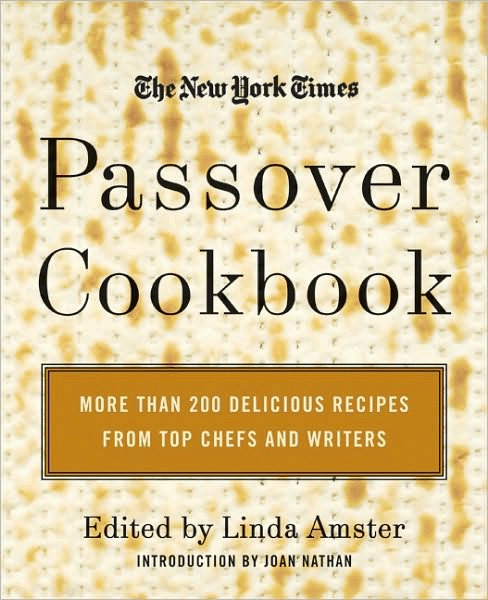 It has been noted that this cookbook features six kinds of haroseth and seven versions of matzoh balls. And so much more. There are recipes from Alice Waters, Charlie Trotter, Wolfgang Puck, and this salmon by Jean-Georges Vongerichten. 1. Preheat the oven to 250 degrees. Season the salmon with a few drops of olive oil and put it on an oiled baking dish. 2. Wash and drain the basil leaves and dry them thoroughly in a salad spinner. Puree them in a blender with the remaining olive oil until smooth. Season to taste with salt and pepper. 3. Bake the salmon for 10 minutes. If the skin peels away easily and the salmon flesh flakes when tested with a fork, it is done even though it may not look it (if you prefer it well done, return it to the oven for three more minutes). Sprinkle the salmon with salt and pepper. 4. Put the fillets on heated individual plates and sprinkle the basil oil in a circle around it. Put a sprig of basil on top of the fish and serve. Truth is, while these are touted as Passover recipes, they are great for any day of the year.